Supremely syrupy and juicy, this natural processed coffee from the Gakenke washing station in Burundi is one of our best offerings. Kiwifruit and pineapple in the aroma make way for strawberry, white grape, and a clean, floral finish. The Gakenke Central Washing Station, established in 1992, is located in Burundi’s northern province of Kayanza near the border with Rwanda. Gakenke is one of several washing stations managed by Greenco. It lies at an altitude of 1672m. Gakenke is named for a plant found in the region known as imikenke, which has thin, hollow stems that locals cut to use as straws for drinking banana beer. 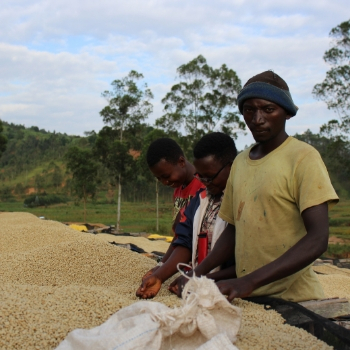 Due to its high altitude and favorable climate, Kayanza is able to produce some of Burundi’s best coffee. Gakenke’s washing station in the Gatara Commune collects cherries from more than 1900 local coffee farmers and is capable of processing more than 400 tons of coffee in a typical harvest season. Coffee farmers in Burundi’s renowned Kayanza region produce some of the most sought-after coffees in all of Africa. This exceptional specialty coffee from Gakenke is richly sweet and fruity. In the cup, fans of natural processed coffees will find vibrant tropical fruit flavors in both the aroma and flavor. Strawberry, kiwifruit, and white grape are prevalent, ensuring that this coffee will quickly become a favorite.